Eventually, gluttony catches up with you. Today was that day, for me at least. I’m not sure whether I actually got sick, or if my body just decided to revolt against me, but it meant today was a pretty slow day. 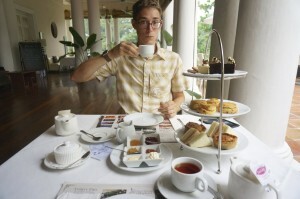 It wasn’t a total loss though, just not as action-packed as might have hoped for our last day in Malaysia. 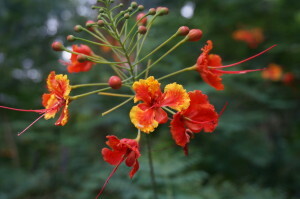 After flopping around the house for a while this morning, we rallied around 10:00 and got some breakfast at a kopitam, then caught an Uber to the Tropical Spice Garden, on the north side of the island. 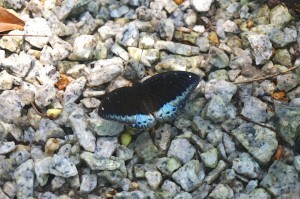 We wandered the trails, hunting butterflies and periodically checking in with the audio guide. There’s a full featured thai restaurant on site, but we just grabbed some “spiced coffee” (coffee with sweetened condensed milk, cardamom, cloves and nutmeg). 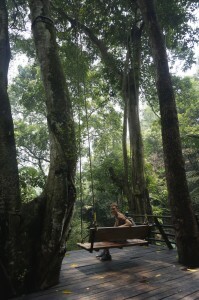 We also enjoyed a swing in the Giant Swing, and some people-watching – everything from a group of Brits celebrating a birthday to local families enjoying picnics. 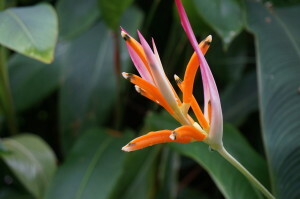 Kat decided to take a leaf out of Aunt Deb’s book and attempt to photo-document the butterflies at the spice garden. 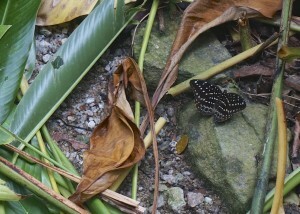 It turns out, butterflies don’t like to sit still when there are tourists tromping through the paths. She did manage a few shots of dragonflies but left disheartened that she can’t share with you the multitudes of varieties we saw. After a couple hours, my body was starting to shutdown, so we decided to head home. Unfortunately, there were no Ubers to be found on the north side of the island, so we took the bus. That meant a much longer ride home, and a much more bouncy time. By the end, neither of us was feeling particularly fresh. I crashed back at home, and Kat went out to find some food and a fizzy drink for us. She returned with some BBQ pork and rice. 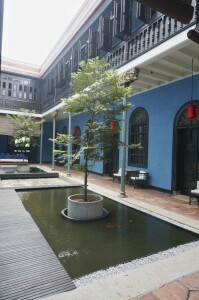 After a couple more hours of flopping, we popped down to China House to have some coffee, read, and snack. It was very relaxing, and better than being cooped up in the house. Eventually, I felt well enough for a wander. 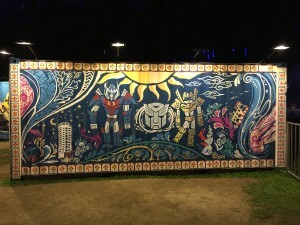 We wound our way through Little India and Chinatown, before ending up at the Esplanade on the shore, where we explored the Transformers Street Art exhibit. 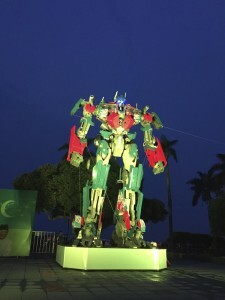 We don’t fully understand why this exhibit exists, but it consists of two large transformers (Optimus Prime and Bumblebee), lit up in crazy colors, with somewhat threatening music playing. 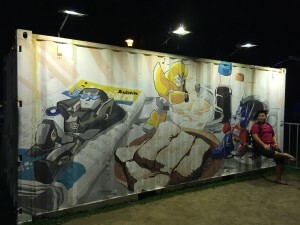 Along side, there’s an exhibit of transformers-themed street art painted on shipping containers. 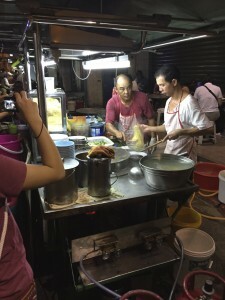 Winding our way back home, we stopped to share one last dish of noodles (wan tan mee) at a street stall, then home. Now we’re packing and getting ready for our 6am trip to the airport. 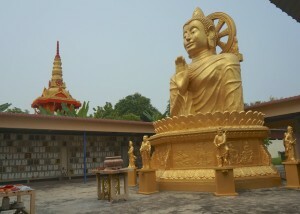 A great trip – we’ll collect our thoughts and post a followup at some point. 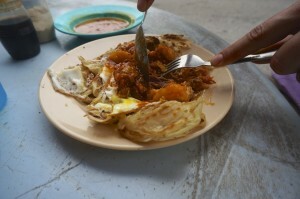 But we’d highly recommend Malaysia to anyone looking for a delicious, eye opening, friendly experience. 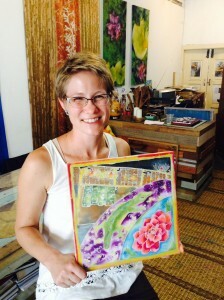 Also, here’s the finished product from Kat’s Batik class yesterday. Awesome! 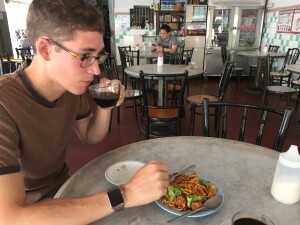 A while back, a friend of a friend connected us with someone in Penang who does food tours. We’d already booked our first tour at that point but thought it’d be fun to have another take on things, so we arranged a private tour with him. At the time, this seemed like a good idea. We got up and popped down to China House for a bit, as Morgan was a bit held up. We had some yogurt and coffee – it’s quickly becoming a favorite place to hang out and read. Morgan picked us up around 10, and the tour began. Our first stop was back to the Clan Jetties for fried prawn cakes. The fact that both tours wanted to go here is a good sign it’s the place for these. We also had the fried pork rolls that we made at the cooking class (theirs were better). For this tour, Morgan wanted to take us outside the heart of the city a bit, to his favorite places. So, we don’t really know where many of these places are exactly. 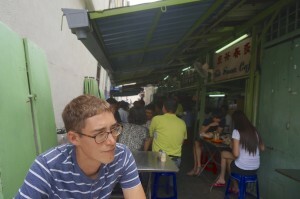 But the next stop was a roadside Char Kway Teow place. For a while, Morgan ran a food stall that shared a cafe with this place, so he knows them well. The Char Kway Teow was full of more types of seafood than the dishes we’ve had in the past, and was really nicely spicy. 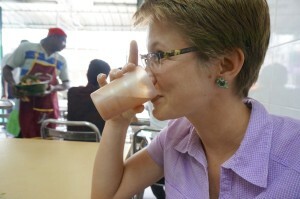 Kat also got to try some hot almond milk, mixed (of course) with sweetened condensed milk. It tasted healthy and not at all bad for you. 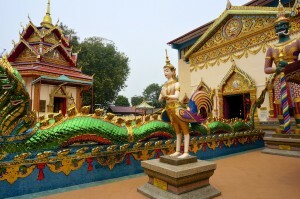 We’d filled Morgan in on what we had and hadn’t seen in the area already, and he suggested we visit a couple temples while we were outside the city. 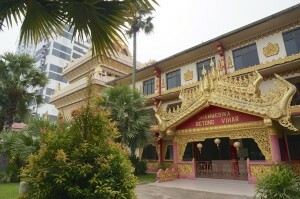 We visited two Thai Buddhist temples, plus a Burmese Buddhist temple. 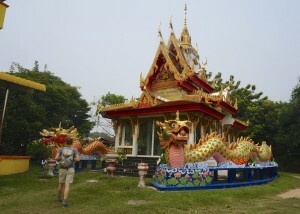 It was fun to see the different styles – the Thai temples are incredibly bright, vibrant and whimsical, the Burmese site is more muted and narrative. Cultured up, we went for fish curry at a popular Muslim Indian place. 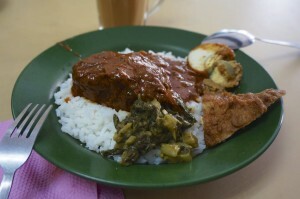 This was a bit like Nasi Kandar, in that it mixed in a bunch of different curries, but also had a variety of vegetables, fish, fried eggs and some chicken. Even more interesting though was the Rasam, a soup. 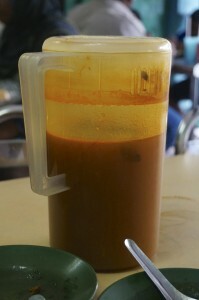 It comes in a drink pitcher that’s passed around the restaurant – you just pour some into a plastic cup to drink. It takes a lot like a liquid pakora, spicy and savory and delicious, but also very light. This is one that I’ll have to try making at home. We also got to try a sort of smoked chili pepper that you eat plain. 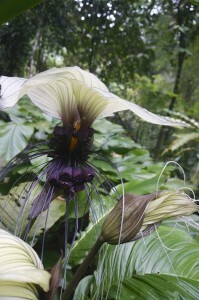 I have no idea how they’re made, but it was one of the stranger taste sensations we’ve experienced. It hits your tongue and reads as unbelievably salty, but the salty flavor quickly turns into a very strong sour flavor. It’s a type of taste we definitely don’t get in American cuisine – Not necessarily something we loved, but we kept eating them to experience it. Leaving the restaurant, we stopped to pick up some samosas (“for later”) and some local biscuits. Then we went to a small stall in an alley for Kaya toast. Kaya is coconut jam, which is mixed with butter and then spread on either charcoal grilled or steamed white bread (we tried it both ways). It’s really delightful – and steamed bread is fun as well. Perfect for making the kaya nice and liquid, without making the bread crumbly. Not quite finished, we took the car across down for a new kind of roti canai, this time with braised beef and a fried egg, plus a really spicy curry. We were mostly dead at this point, but it was too delicious not to eat. We hung out there for quite a while, chatting about work and the history of the city, cultures and world travel. Before letting us go, Morgan took us to one last hawker market to pick up some spicy steamed rice packets (in banana leaves) for later. You know, so we wouldn’t go hungry. We chose to walk home, mostly so we wouldn’t pass out in his sight. After making it back to the apartment and flopping around in shame for a while, we rallied enough to go for a bit of a stroll. 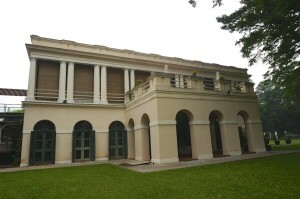 We stopped in to the Georgetown Heritage Center and the Penang Heritage Trust to pick up some maps and pamphlets, then went to the Pinang Peranakan Mansion, which is a restored mansion of the style that was popular with the Baba Nyonyas (Malaysian Chinese) at the turn of the century. Kat went a little crazy photo-documenting textures and designs. 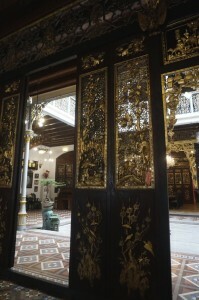 The mansion includes an extensive jewelry museum – these folks had no shortage of gold and diamonds. 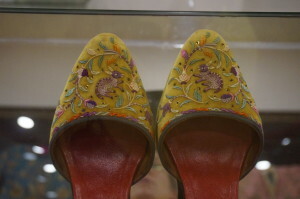 The traditional craft of Nyonya women is intricate beadwork – shoes to be precise. A measure of a woman’s worthiness as a wife was the number of shoes and bags she was able to make. The more shoes she had, the more desirable she was as a potential partner. 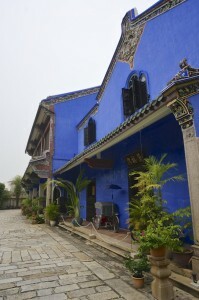 The museum included an entire wing dedicated to intricately beaded bags, pillows and shoes. After that, we wandered rather aimlessly, stopping for coffee and to check out the ruins of the Runnymede. 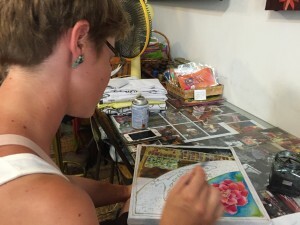 The makeshift tents on the street were beginning to come alive as the Chinese Buddhists prepared to celebrate another night of the Hungry Ghosts month, which includes nightly fireworks and gatherings. It’s a fascinating event. Eventually, we made our way home, having lost all will to carry on. Joyfully.